I am exhausted. 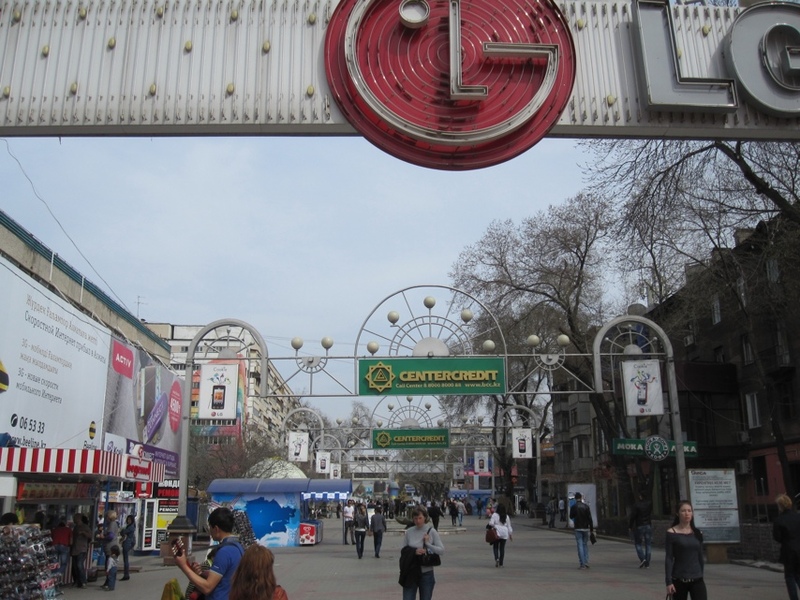 Almaty is significantly larger than Bishkek, and I walked around the entire city for about 6 hours. 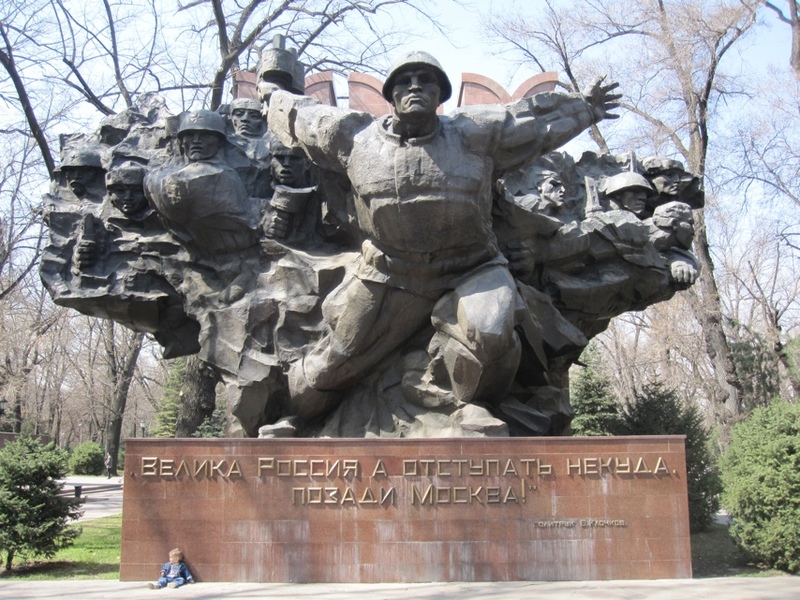 My first impression was that Almaty was rather featureless, lacking the soviet style grandiose statues I expected. But after the first mile of walking, I realized they were just spread out over a larger area. The Kazakh diversity is very similar to the Kyrgyz. There is a nicer infrastructure that is apparent when walking down the street though. There are some phenomenal sites to see, and humongous buildings to try to fit in your camera viewfinder. 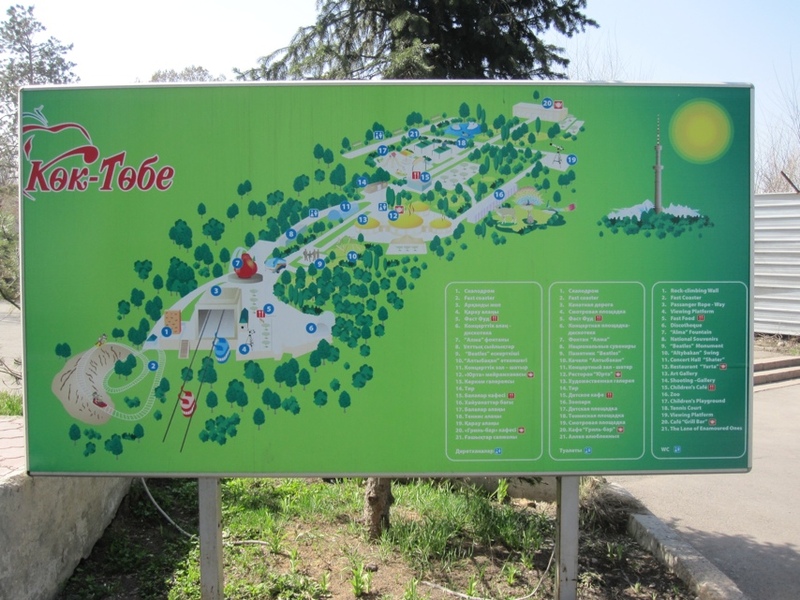 I headed in the general direction of the Kok Tobe (missing umlauts – should be pronounced “cook Toby”) cable car tram that is supposed to have great scenic views over Almaty, but it must be too early in the travel season, because it is only open on weekends currently. It was a pretty good distance back to Zhibek Zholy (a west-east running promenade filled with buskers, vendors, artists, and an ethnic Russian rapper who was butchering Ice Ice Baby – “Yo, check out my hook while my DJ revolves this”). I walked all the way down to Pushkin St. and made my way to the Center Mosque. 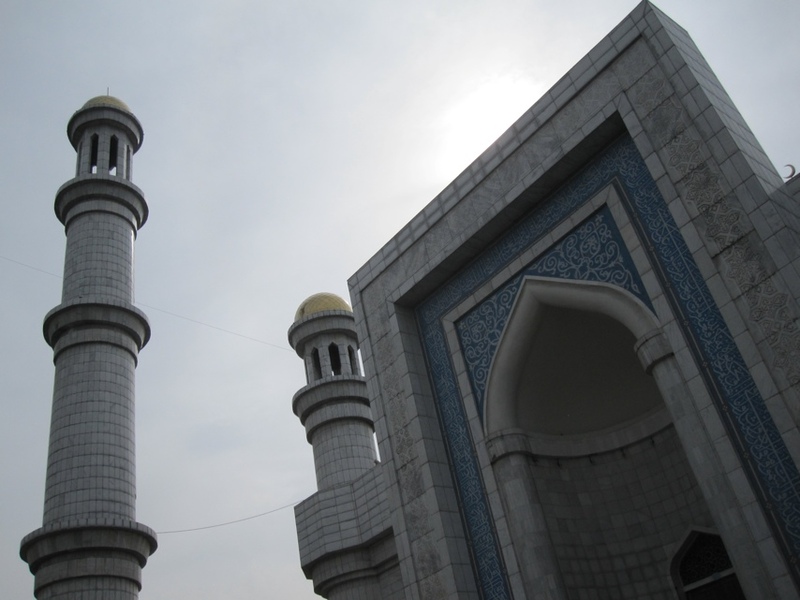 It is supposedly the largest mosque, able to hold 3,000 people, in Kazakhstan and is available for worship only. 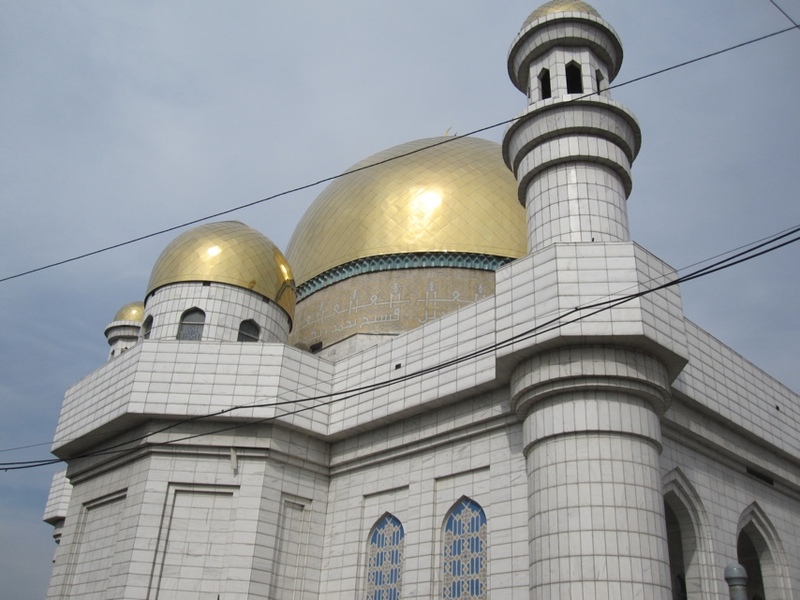 Non-Muslims are not allowed inside the mosque. 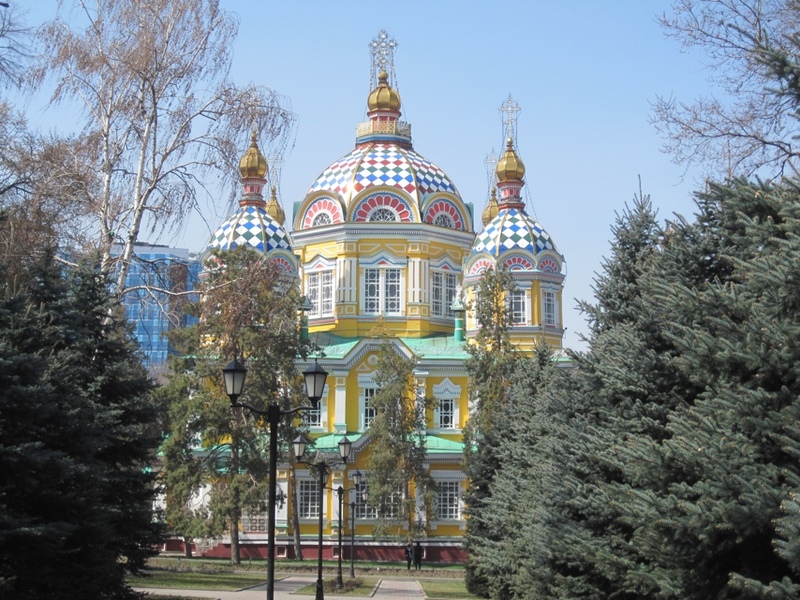 Almaty is built on a large hill, so you are always walking down or up. It’s hard to get lost with this constant reminder of which direction you are traveling. I have to say, the neighborhood gets progressively sketchier heading downhill on Pushkin St. The bartering from the street vendors gets more aggressive, and the crowds of people with seemingly nothing to do but gather together grow larger. Got some great photos of the mosque though. One thing that struck me today about both Kazakhstan and Kyrgyzstan, I have not seen a single tourist. Nobody. It’s really weird actually. Maybe it’s still too early in the travel season, but the weather is great here (today it was about 80 Fahrenheit). Maybe the droves of tourists will come next month, but it is a weird experience not running into a single traveler. This entry was posted on April 11, 2011 at 04:44 and is filed under Kazakhstan. You can follow any responses to this entry through the RSS 2.0 feed. You can leave a response, or trackback from your own site.